Although previous molecular phylogenetic studies have found strong support for relationships among some orders of Anthozoa, key regions of the tree remain very poorly resolved (see figure below). We will construct a well-resolved molecular phylogeny using ultraconserved elements (http://ultraconserved.org/) and their flanking regions to understand character evolution within the group. Funded by NSF DEB. To begin UCE discovery, we are sequencing eight new Anthozoan genomes (see genomic resources). Currently, there are few genomes that have been sequenced from across the clade. We will design probes to target 100s to 1000s of UCEs and their flanking regions. Using these newly designed probes, we will sequence at least 192 species from across the clade. These probes will be made freely available. 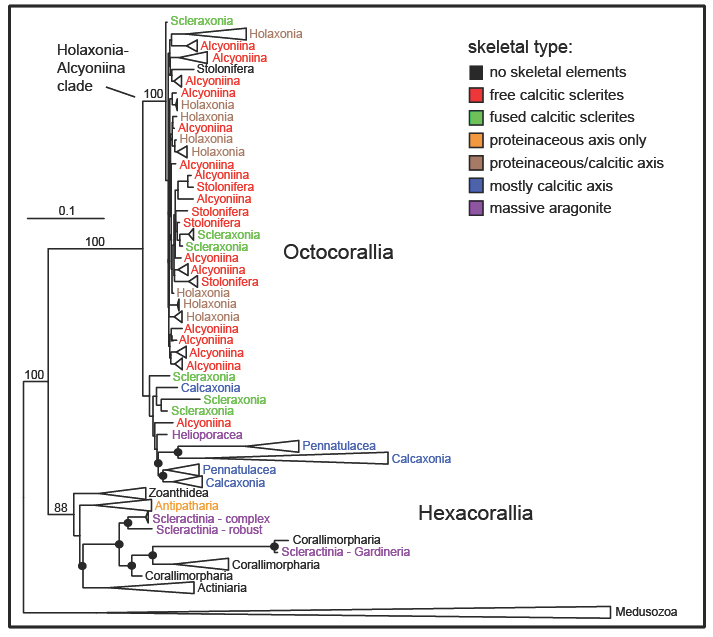 Skeletal type mapped on a phylogeny of Anthozoans, inferred from 18S, 16S, and 28S rDNA (Data from Cnidarian TOL project).